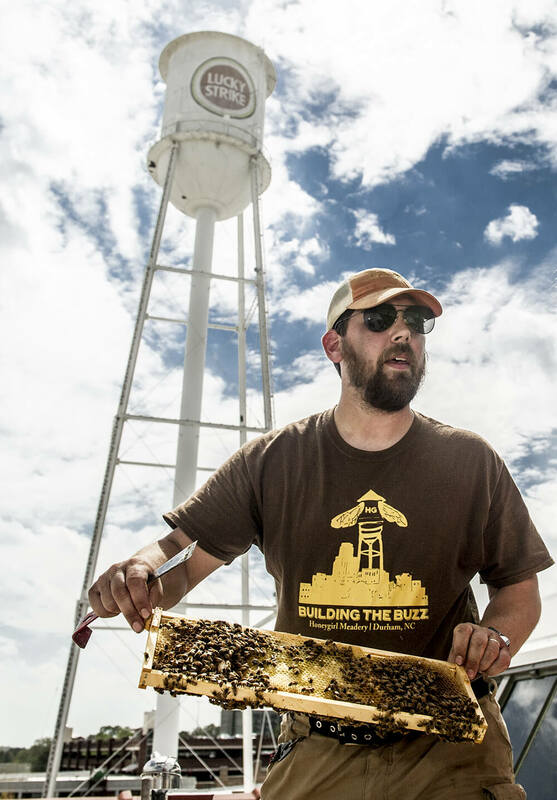 There’s buzz in Durham at Bee Downtown, a nonprofit that seeks to increase public awareness of the importance of honeybees through urban beekeeping. Editor’s note: This story was published on ourstate.com in May 2015. As they move their tassels from right to left, newly minted college graduates are bound to face uncertainty. A member of North Carolina State University’s Class of 2015, Leigh-Kathryn Bonner understands this well, but she doesn’t dwell on it. Instead, she’s turned her attention to a group of tiny friends with an even less clearer future: honeybees. In 2014, she founded Bee Downtown, a Durham-based nonprofit that seeks to increase public awareness of the importance of honeybees and combat Colony Collapse Disorder (CCD) through urban beekeeping. Fun has been a major factor in her career decision, just as it was when she was registered for classes and enrolled in an introductory course on bees and beekeeping taught by the late, world-renowned entomologist John Ambrose. “I thought, ‘Oh, it’s an easy class. I get to eat honey and biscuits and learn about bees. I already know about bees, so this is going to be great,’” says Bonner with a laugh. Her grandfather and uncle are renowned beekeepers. 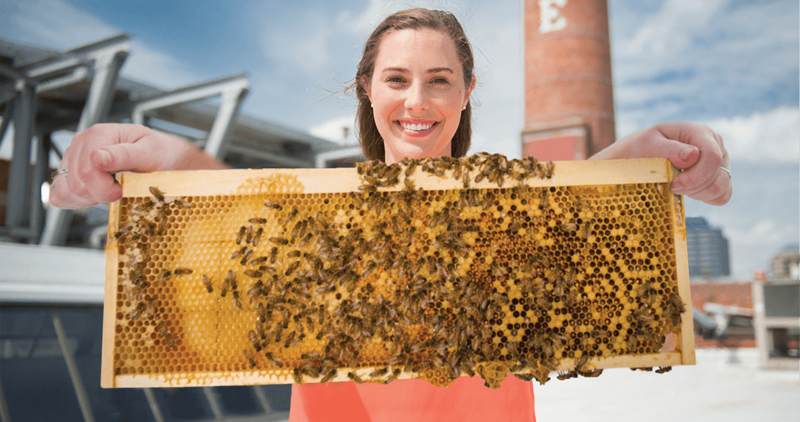 While later studying abroad, she learned about the increasing popularity of rooftop beekeeping and became — well — one busy bee. She pitched the idea of rooftop hives to the owner of the American Tobacco Campus as one of Bee Downtown’s first initiatives. “Before I could finish, they said, ‘Yeah, when can we get them?’” Bonner says. Bee Downtown also received a grant from Burt’s Bees to install an observation hive, the largest of its kind in North Carolina, outside of the company’s corporate office at the American Tobacco Campus. Bonner, whose family is from Farmville, has always felt a connection with agriculture, but she recognizes that isn’t the case for many children living in urban areas, even in the nation’s eighth largest agricultural state. The hive at Burt’s Bees has proven to be an effective tool for teaching others about the incredible power of these six-legged insects. “It’s amazing to watch kids at that hive because they can pick up on things so fast,” Bonner says. Curious passersby, young and old, can peer through the glass surrounding this hive to see as many as 15,000 bees hurrying back home with the pollen they’ve collected to make that tantalizing golden nectar. Not long after, as if on cue, a man with a charming European accent stops by the hive and marvels at it. “Do you come out here and check on them a lot?” Bonner asks. “She’s right there. Do you see her? She’s laying an egg. She’s got a green dot,” Bonner says. The queen bee — whose name is Rosie — was painted with a green dot to make her easier to spot. “Finally! Finally! So, there is the queen. Now I can rest in peace,” he says before continuing on his merry way. These bees are mighty, but they could always use more human champions, especially as CCD continues to leave bee populations across the globe reeling. “There is no one smoking gun for it,” Bonner says. But of course, there are the pesticides. And there’s climate change. Ask any beekeeper about the parasitic varroa mites, and they’ll shudder. Bonner says a lot of these problems can be traced back to a lack of diversity in honeybee gene pools, which served as the topic of her college thesis. Interestingly enough, bee colonies in urban locations seem to fare better than their counterparts in rural areas, according to recent research. Bonner points to the fact that more developed regions offer a stable, nonmoving environment, an abundance of water sources, and fewer pesticides. “(Urban bees) can act as feeder populations to rural areas to build population size, so we have enough pollinators that we don’t have to truck bees around the United States,” she says. Like the honeybees she tends, Bonner’s mind is constantly abuzz as she thinks of ways she can expand upon Bee Downtown’s mission. Her goal is to install 10 observation hives in each of the top 100 major cities across the country as part of a larger hope to help save the world’s bee population. “It might not work, but I’m going to try,” she says. After all, these bees are worth fighting for. Buy locally-made honey: The only way to make sure bees stick around is to ensure their keepers do, too, so it’s important to support their small businesses. What’s in it for you? “It’s a little more expensive, but it’s better for you,” Bonner says. Honey produced on a larger scale is often stripped of its nutrients (and flavors!) that come from pollen when it is heated and processed. Plant bee-friendly flowers: Make sure to add a few different types of wide-brimmed blooms in your yard. “Sunflowers are like a landing pad for bees,” Bonner says. Don’t swat: Popular to contrary belief, a honeybee is not an aggressive insect bent on stinging anyone in its path. When a friendly bee has extended its welcome, stay calm. If it still won’t leave you alone after you try walking away, step away from the sun into the shade or vice versa. “They don’t do temperature and directional changes well,” Bonner says. Call a beekeeper: If you notice a colony of honey bees swarming on your house or car, call the local beekeeper — not an exterminator. He or she will remove the bees and take them to safety. Become a beekeeper: If you’re looking to get even more involved, try your hand at beekeeping by taking the proper certification classes and becoming a member of the North Carolina State Beekeepers Association, the largest in the United States. Just realize that keeping bees is much like having a pet that you’ll take care of for years to come. It’s a commitment, but a sweet one at that.